Throughout this tutorial, we’ll see how you can implement file upload in Django and Django REST Framework with a step by step example. Our application will expose an /upload endpoint that accepts POST requests that contain the file posted with a multipart/form-data content type using FormData. For the frontend, we’ll be using Angular 7 to create a simple interface that allows the user to select a file and upload it to the server via a POST request and FormData. These tutorials is divided in two parts: In the first part we’ll create the Django application and make a REST API client to make sure it properly work. In the second part, we’ll proceed to create a frontend with Angular 7. Familiarity with Python and Django. Node.js and NPM installed on your system. These are required by Angular CLI. 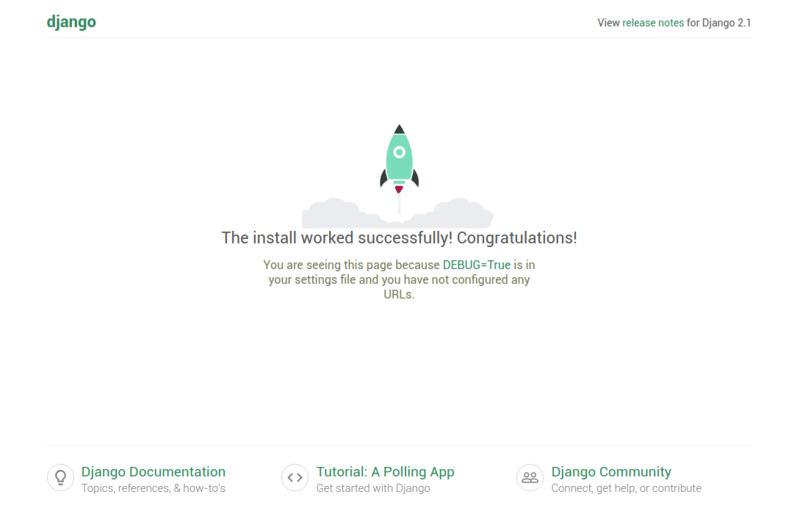 As of this time, this command will install Django 2.1.7. $   mkdir django-file-upload $   django-admin startproject fileuploadexample . Note: Please note that the files uploaded to FileField or ImageField are not saved in the database but in the file system of your server. In the database it’s the fields are represented by a VARCHAR containing the reference to the file. It’s mandatory to MEDIA_URL and MEDIA_ROOT in your settings file. See How to use Django ImageField, and why use it at all? from rest_framework importserializers  class FileSerializer(serializers.ModelSerializer):     class Meta:         model = File         fields = "__all__"
FileUploadParser parses raw file upload content. The request.data property will be a dictionary with a single key file containing the uploaded file. Using the static(settings.MEDIA_URL, document_root=settings.MEDIA_ROOT) we can serve media files in development mode. Note: Make sure to name the file field as file, which needs to match the name of the model field name. In our example it’s file. You can check if the media folder of your project contain the uploaded file and you can access your uploaded file from your browser by using appending the path retruned from in the response to the URL of your server i.e http://127.0.0.1:8000/media/925364568cc67bfb7978b8cc65f40125_OEn02GO in our example. Check more options from the docs. You will be asked if you would like to add routing. Type y. And also which stylesheets format you would like to use, choose CSS. Next hit Enter and wait for the CLI to generate your project’s files and install the packages from npm. You can access your application from the http://127.0.0.1:4200 address. We first import HttpClient and we inject it via the service constructor. 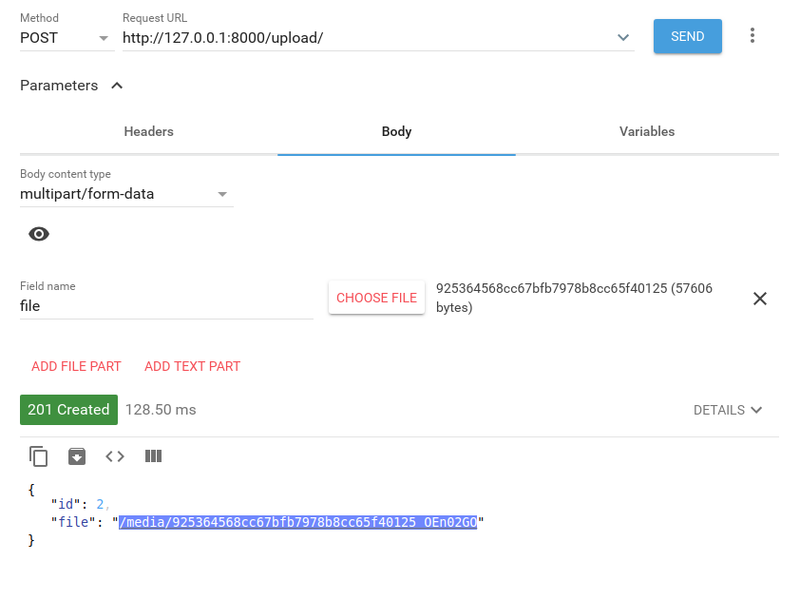 Next, we define an upload() method that takes an instance of FormData and send it to Django REST API endpoint with a POST request. Next, let’s create a component that contains the form to use selecting the file and submit it the django upload endpoint. We first create a reactive form with one profile field in the ngOnInit() method of the component. Next, we define the onChange() method which gets called when the user chooses a file in the file input interface. We simply set the selected file as a value of the profile field of the reactive form. Finally, we define the onSubmit() method that gets called when we click on the submit button of the form. In this method, we create a FormData object, we append the value of the profile field of the form to a file field (this needs to correspond to the name of the field that the django server expects) and we send the FormData object to the API server with a POST request. In this tutorial, we’ve seen how to build a full-stack example with Django and Angular 7 for uploading image files. In the backend, we used Django REST Framework, FileUploadParserand FileField and we also enabled CORS using django-cors-headers. In the frontend, we used FormData to create an object to correspond to a form with multipart/form-data type and HttpClient for sending POST requests to the backend. The PyCon staff, volunteers, tutorial presenters, speakers, poster presenters, and community members have been hard at work preparing for PyCon 2018 in Cleveland, Ohio. Along the way, we’ve gotten a chance to have some solid discussions about what makes PyCon good as well as where it can improve. The PyCon staff and Python Software Foundation Board of Directors strive to improve year over year. After realizing that PyCon 2014 and 2015 conflicted with the observance of Passover, PyCon’s scheduling has explicitly avoided major religious observances and US holidays. Conflicts were known and understood in advance of booking. For conflicts that staff did not have personal experience with, members of the community were asked to help fill in the blind spots. In spite of this we failed to properly and openly communicate the known conflicts, which allowed for speculation that they simply hadn’t been considered. This is a fair assumption, but it is not the case. In addition, our lack of transparency lead to the conflict being a surprise for many as they registered for PyCon or began booking their travel and accommodations. With the help of our community, we’ve made adjustments and are planning specific events and spaces to better support mothers at PyCon this year. Moving forward, we will be more transparent about the known conflicts with PyCon’s dates and the ways that we work to accommodate groups which are impacted by those conflicts. To better fill in the specifics of how it occurs, the team that works year-round to manage the logistics and planning for PyCon worked to develop a summary of that process, and we’d like to share it with you today. PyCon: How are the cities and dates selected? The cities that do fulfill our requirements, respond back with a proposal, which usually includes one to three date options depending on their availability. From there we work with all available cities on space — that is usually the most work. Each city sends us the space they think will work. Our Event Coordinators go through every line to make sure it matches our needs. If a city has the space we need, we look at hotels. We consider the distance of the hotels from the convention center and their price. If hotel expectations are met, our Event Coordinators plan site visits to those cities. * Steps can change from time to time as we constantly try to refine our process. We’ll run through a sample scenario of how the above mapped out to the selection of 2020 and 2021, which was recently finalized. We started with seventeen cities. We ended up only doing site visits to four cities. The large drop in cities is mainly because several cities turned us down for various reasons such as already being booked or not having enough space. PyCon requires 11 days of meeting space for setup, tutorials, the main conference, and sprints. Because we have such a lengthy span it is not always easy to find locations that can accommodate us. City A was a large city and the dates we were looking at were in February. Since we were looking at February dates, the hotel rates were more in line with our expectations. However, once we saw the space we realized it would not work. City B had great space and good hotel rates so we were hopeful. It also had lots of places to stay near the convention center. City C had good space and hotels, but we did not feel safe walking around in it at night. It was also the second most expensive of the three. City D was having most of the convention center rebuilt but it looked promising and the hotels matched our expectations. One thing we noted is that the area around the convention center lacked places that PyCon attendees would enjoy and would have to take buses to other neighborhoods. The expenses involved with City D were also the highest so we did not select it. In the end, we recommended to the Board of Directors that we move forward with City B for 2020. We plan to announce the city soon – possibly at PyCon 2018. If you are aware of any conflicts we’ve missed, please reach out to pycon-local at python dot org. We will update this list and notify the community. * the 2020 holiday/import date list was updated on Feb 18, 2019 thanks to community feedback we received. The Django meetup was at Prezi. They have a great space. They are big Django users. Jaden Windle, @jaydenwindle, lead engineer at Jetpack. They moved from Django REST Framework to GraphQL. It sounds like a small app. They’re using Django, React, and React Native. I think he said they used Reason and moved away from it, but I could be wrong. They had to do a rebuild anyway, so they used GraphQL. He said not to switch to GraphQL just because it’s cool, and in general, avoid hype-driven development. GraphQL is a query language, spec, and collection of tools, designed to operate over a single endpoint via HTTP, optimzing for perf and flexibility. Query for only the data you need. Easily query for multiple resources in a single request. Great front end tooling for handling caching, loading / error states, and updates. Graphene is the goto framework for GraphQL in Django. He showed an example app. You create a type and connect it to a model. It’s like a serializer in DRF. It knows how to understand relationships between types based on the relationships in the models. He showed the query syntax. He showed how Graphene connects to the Django model. You’re returning raw Django model objects, and it takes care of serialization. There’s a really nice UI where you can type in a query, and it queries the server. It has autocomplete. I can’t tell if this is from Apollo, Graphene, or some other GraphQL tool. You only pass what you need across the wire. When you do a mutation, you can also specify what data it should give back to you. There is some Mutation class that you subclass. The code looks a lot like DRF. Subscriptions aren’t fully implemented in Graphene. His company is working on implementing and open sourcing something. There are a bunch of other possible real-time options–http://graphql-python/graphql-ws is one. There’s a way to do file uploads. Important: There’s this thing called graphene-django-extras. There’s even something to connect to DRF automatically. In the Q&A, they said they do use Apollo. They’re not yet at a scale where they have to worry about performance. He’s not entirely sure whether it’s prone to the N+1 queries problem, but there are GitHub issues related to that. You can do raw ORM or SQL queries if you need to. Otherwise, he’s not sure what it’s doing behind the scenes. You can add permissions to the models. There’s also a way to tie into Django’s auth model. Their API isn’t a public API. It’s only for use by their own client. Christophe Pettus from PostgreSQL Experts. He thinks the ORM is great. The first ORM he wrote was written before a lot of the audience was born. Sometimes, writing code for the ORM is hard. Database agnosticism isn’t as important as you think it is. For instance, you don’t make the paint on your house color-agnostic. Libraries have to be DB agnostic. Your app probably doesn’t need to be. Django’s ORM’s SQL is much better than it used to be. Don’t use __in with very large lists. 100 is about the longest list you should use. It’s not hard to chain together a bunch of stuff that ends up generating SQL that’s horrible. The query generator doesn’t do a separate optimization pass that makes the query better. It’s better to express .filter().exclude().filter() in SQL. There are so many powerful functions and operators in PostgreSQL! You can write raw SQL, and yet still have it integrate with Django models. You can even get stuff back from the database that isn’t in the model definition. There’s some WITH RECURSIVE thing in PostgreSQL that would be prohibitively hard to do with the Django ORM. It’s not really recursive–it’s iterative. You can also do queries without using the model framework. The model framework is very powerful, but it’s not cheap. Interesting: The data has to be converted into Python data and then again into model data. If you’re just going to serialize it into JSON, why create the model objects? You can even create the JSON directly in the database and hand it back directly with PostgreSQL. But make sure the database driver doesn’t convert the JSON back to Python 😉 Return it as raw text. There are also tables that Django can’t treat as model tables. For instance, there are logging tables that lack a primary key. Sometimes, you have weird tables with non-Django-able primary keys. The ORM is great, though. For instance, it’s great for basic CRUD. Interfaces that require building queries in steps are better done with SQL–for instance, an advanced search function. Don’t be afraid to step outside the ORM. SQL isn’t a bug. It’s a feature. It’s code like everything else. Do use the ORM for operations that it makes easier. Don’t hesitate to use the full power of SQL. Whether you put your SQL in model methods or managers is a matter of taste. Having all the code for a particular model in one place (i.e. the model or manager) is useful. Use parameter substitution in order to avoid SQL injection attacks. Remember, all external input is hostile. You can’t use parameter substitution if the table name is dynamic–just be careful with what data you allow. If you’re using PostGIS, write your own queries for sure. It’s really easy to shoot yourself in the foot with the GIS package.